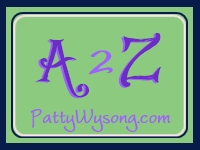 It's time for another Round of a2z, Patty Wysong's meme. Just so you know this is a note to me--not so much to you--my readers, though you might find yourself in what I write. This post is all about me and my attitude. I've been grumpy, worried, cranky and annoying these past few months. I can blame it on a myriad of things--sick kids, politics, aching neck, things aren't going the way I want-- pick anything and I can develop a showstopping diva attitude in under 20 seconds. The thing is, I don't care much for myself when I'm wearing "that attitude" you know the one that got you sent to your room as a teenager? That ugly personality that flashes to the surface screaming life is all about me and the rest of you better get used to it? So I'm shifting my attitude. I want to go back to the kinder me. How am I going to do that? I'm not doing it alone. I'm picking up my bible and reading through Mark. I can learn from Jesus how to accept things, let God be in charge and focus on the good. My other plan? Listen to this video by Jason Gray. Remind me who I am. Stick with me, I think it might be a bumpy ride because it's easier to have a wrong attitude. Finished the proposal for Seeking Normal--my crit partner has it. Just got the crit back on Seeking Normal. Not a lot to fix. Yay! Excellent point of view. I wish more people would realize what "that attitude" looks like on themselves. It would do everyone some good (including myself) to have an attitude check now and again. Rachel, I hadn't even considered how "that attitude' looks! Good point. Well you haven't been as cranky as I was when I was confined to that blasted hospital bed in my living room. But I remember having those same thoughts about myself: man, this is some ugly attitude. Amen. And ouch. I've been struggling with some attitude adjustments, myself. I'm trying to remind myself that in ballet, an attitude is a position, and the position I take in any circumstance is what will determine my victory or my defeat. Gotta get in position! Great start for A2Z round 3! Thanks for sharing that video. It's convicting and precious. Blessings on you, my friend. You're welcome, Valerie. Blessings back at you!